Pussers Blue Label Rum is a popular Rum available from 31dover.com in 70cl to buy online. Visit 31dover.com for the best price for 70cl of Pussers Blue Label Rum or compare prices on our other Rum products. The new 40% bottling. The colour is a rich mahogany, though clear. The aroma is a burst of classic demerara with a wonderful mix of brown sugar and molasses. Notes of leather, tobacco, dried sultanas, nutmeg, clove, and cassia. The aroma finishes with soft oak, caramel, and rich English toffee. Pussers full, rich flavour is all natural, no flavouring agents are added. It is the only rum whose flavour is sufficiently distinctive to be savoured through the ingredients of just about any cocktail. Where to buy Pussers Blue Label Rum ? Pussers Blue Label Rum Supermarkets & Stockists. 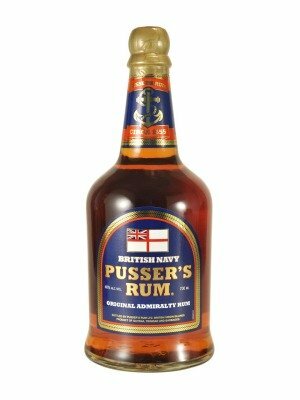 You can buy Pussers Blue Label Rum online in most retailers and find it in the Rum aisle in supermarkets but we found the best deals online for Pussers Blue Label Rum in 31dover.com, DrinkSupermarket.com, TheDrinkShop, and others. Compare the current price of Pussers Blue Label Rum in 70cl size in the table of offers below. Simply click on the button to order Pussers Blue Label Rum online now.